The only way to view these images is by using the Slideshow option on the right side of your screen. The landscapes are so vast, that even a large screen will fail to display the grandeur. Still, it's the best way to approximate the feeling of being there. These images include two sunrises that show the setting of the moon. The first series was taken at Dante's View; the second series was taken at Zabriskie's Point. Both views look over at the mountains on the other side of the valley, which are about 7 to 10 miles away. One of the hikes depicted is in Fall Canyon--a spectacular 3 mile up-hill hike that ends at a dry waterfall. We had the canyon to ourselves. There are a few shots of the dunes, but nothing that interesting. The images of colorful stone formations were taken at Artist's Drive. 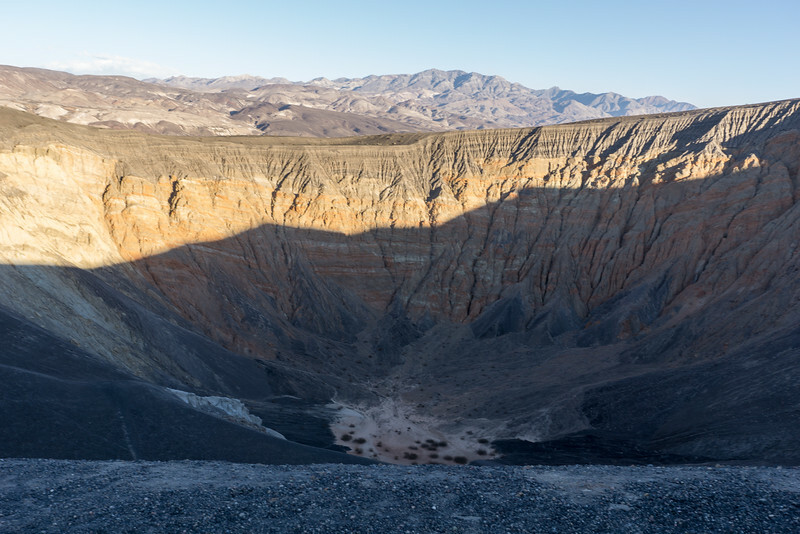 The winds at Dante and Zabriskie were fierce, but when we got to Ubehebe, the remnant of a series of volcanos, we were met with hurricane-like winds that could lift you off your feet.